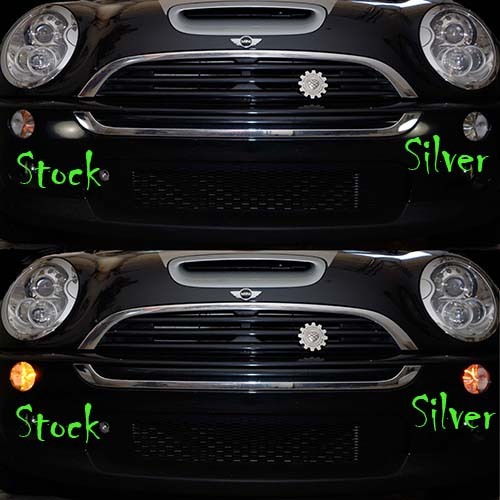 Silver Front Turn Signal bulbs for your 2007+ R55 R56 R57 R58 R59 MINI Cooper and Cooper S. No more ugly orange egg yolk look in your clear corners. The simplest styling upgrade for any MINI. These silver turn signal bulb appear silver or clear when installed, but when they flash they still flash amber so they are still street legal. All our Stealth Bulbs™ are backed with our unconditional Satisfaction AND Lifetime Guarantee so shop with confidence. You are purchasing the best longest lasting coated signal bulbs on the market today! Select the kind of light you have to ensure you get the right bulbs.